From the Desk of Our Executive Director – Selkirk Outdoor Leadership & Education (SOLE), Inc.
SOLE’s blog from the desk of our Executive Director! As spring, summer, and fall arrives, it is a beautiful time to explore our local wildlands and is feasting time for all creatures – great and small – including our local bears. As such, it’s imperative that we take Bear Aware principles with us into as we journey into the backcountry to bike, hike, paddle, camp, hunt or fish. In the fall of 2016 several grizzly attacks occurred in Montana (see video here – caution graphic material). This encounter happened on the heels of two other additional grizzly attacks of hunters in the same state. What was once a rarity (to see a grizzly in the wild, western backcountry) is becoming more prevalent due to the success in the conservation of the species, and the loss of habitat that it calls home. In addition, black bears can also be troublesome and often more unpredictable and can lead to unwanted encounters. Whatever the species, it is imperative that when we venture into the wild, we must remain vigilant and be bear aware. Each season poses its own potential risk. When spring emerges hibertating bears awake from their slumber on the search for one thing on mind – food. Because bears are frankly hungry, travelers should use caution when traveling into bear country. Consider the following considerations when hiking or camping in bear country, and if you do so you will be equipped and ready with a solid wildland ethic. Like spring, fall bears are quite active – storing reserves for their upcoming hibernation. Folks often aren’t sure how to minimize their contact with a bear when exploring our wild landscapes. So, to assist with this, we will share some Leave No Trace Outdoor Skills and Ethics that we utilize (and teach) in the field, which are supported by our partners at The Leave No Trace Center for Outdoor Ethics. We hope this information will help you minimize and mitigate this risk, and allow you to enjoy the remaining days of fall in the backcountry. So let’s get started! Do you require bear canisters and/or require that you store your food and other “smellables” in a particular manner? Has there been any recent bear activity in the area that you will be visiting? The old adage, “a fed bear, is a dead bear” is true. When we travel in the backcountry it is essential to minimize bears encounters and their contact with human food. Once bears have been introduced with human food they will continually seek it out as an easier food source, leading to continued encounters. This is called habituation. On most occasions, this leads to a bear being “taken down” (e.g., killed). This also includes selecting appropriate campsites, disposing of waste properly, considering appropriate food / smellable storage, and overall respecting wildlife. A good consideration is to local open space areas to camp versus those that are densely vegetated to allow for more awareness for both you and the bear of each other’s presence. In addition, you may consider the “bear”muda triangle (see image to the right), which positions your cooking, shelter, and food storage area 100 yards from each other. Another important LNT Principle is Dispose of Waste Properly. This can affect whether or not we lure in one of our furry friends, and can be counterproductive. For example, while broadcasting grey-water may be a common practice when considering this principle, it can also spread the odor when doing so on land. Not ideal in grizzly country. Therefore, other considerations can include digging a sump (6-8″ deep) to dispose of grey-water from cooking, cleaning and brushing teeth. Read more from our partners at Leave No Trace here. When considering storing food and “smellable” items (i.e., sunscreen, toothpaste, deodorant, lotions, chapstick, etc.) some land management agencies in bear country allow backcountry users to utilize bear hangs (see image left) in lieu of bear canisters. If you do decide to go old school, and “hang a bear bag”, there are definitely some considerations to take. You’ll need to consider an appropriate set-up, including specific location, appropriate distance (e.g., minimum of 5′ x 5′ x 12′), durable “bear bags”, rope, and some know how. Review some additional tips from The Leave No Trace Center for Outdoor Ethics here and check out the image above to help get you started. In addition, if you choose the bear hang method, make sure that the area that you are visiting actually has trees! Alpine areas like those with tundra where bears can frequent do not, so you’ll need to make adjustments to your bear storage considerations. If the terrain you will be traveling in is not advantageous to a bear hang and/or the land management agency does not allow bear hangs in their food storage allowances, you will have to either purchase or rent a bear canister. There are several great models, and if you don’t want to purchase one and won’t use it frequently you can actually rent them for a nominal fee from a land management agency or gear shop. After all, they are kind of spendy! If you decide to go this route and are venturing into the our neck of the woods, in the Selkirks, Purcells, or Cabinets feel free to contact us to rent one directly from us! As one of the 7 principles of Leave No Trace, and an awareness of what exists out there, one might think it should go without saying – Respect Wildlife. Still it’s worth noting. Here are some tips to assist you in doing just that. When traveling in bear country make noise! Yelling, “Hey Bear!” is the go-to, but should be done on average of once every 5 – 10 seconds. Some people recommend every 30, however, you can carry a lot of ground in 30 seconds and your voice doesn’t carry too far in dense vegetation or near a noisy mountain creek. In addition, when entering dense vegetation, around blind corners, and near loud creeks we recommend to also add some clapping to really let you presence be known. One of the main contributing factors to unwanted bear encounters is alarming a bear, and catching them off guard. Not a great scenario, especially when it’s a healthy sow with cubs. While we all love to have those pristine, peaceful moments in the wild, it’s important that when traveling in bear country to also minimize encounters for their sake and yours. Travel in groups of 4 or more. It has statistically been shown that hiking in groups of four or more is safer while traveling in griz country, however one could argue that it may be a wise practice in any type of bear country. View at a distance. Bears can cover a large distance in a short amount of time. While they are amazing to view in the wild, putting real estate between you and a big ‘ole bruin is a good thing, so use binoculars at a distance. To give you some perspective, according to the Fish and Wildlife Service a grizzly can cover 50 yards in 3 seconds, or 40 miles and hour. That’s faster than a racehorse over short distances! Learn more bear encounter facts from the Fish and Wildlife Service here. Effective use of bear spray to deter an encounter! Bear spray has proven itself to be quite effective, and often the last resort. However, it is only as effective as the actual user. We recommend that you research what type of bear spray to purchase, and educate yourself on how to use it. 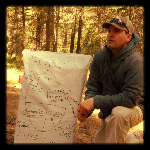 Here is a great little introductory video from Rich Landers of the Spokesman-Review (Spokane, WA) on how to use bear spray effectively, and here is a great powerpoint from the United States Geological Survey on bear spray. Also here is an excellent blog entry written by Todd Wilkinson that shares evidence-based research on bear encounters and the use of bear spray. For more information and to become more backcountry savvy, consider taking one of SOLE’s Leave No Trace Courses, or design your own! These courses allow participants to learn and master these skills in the environment that they will be traveling in. 5 ways how a summer SOLE Experience can strengthen your child. From backpacking adventures into the wilds to walks into an urban park, summer provides the opportune time to unplug and reconnect to the great outdoors. With an uptick in standardized testing, homework, or other school / after-school responsibilities during the regular school year there is little time for most families to venture out to the great unknown, and many simple do not for one reason or another. Despite these real barriers a growing body of evidence is showing us why immersion in the outdoors is critical for our own well-being, as well as, our community and its environment. So what can you do about it? At SOLE, we recommend that parents strongly consider extra-curricular programming that specifically targets this need, especially when school isn’t ‘in session’. 5 ways your child can benefit from a SOLE Experience SM this summer! Nurturing their brain through nature. Let’s face it, there is no better way to decompress than being in a beautiful natural setting. SOLE uses extended summer expeditions to promote such opportunities for youth and young adults. This way of life can be rather simplistic fostering an environment that lacks the stress that weighs on our 3 pound computer in the semi-quasi real world. The end result? Rest and restoration. National Geographic. ‘This is Your Brain on Nature’ (January 2016) gives props to this very cause and effect relationship, coupled with the term, coined by a cognitive psychologist David Strayer, known as the “three day effect”. In short, Mr. Strayer spent a great deal of time researching the restorative effects of nature-based immersion on one of our most important resources – our brain. Creating healthy behaviors and patterns. Remember the days of building forts, exploring and learning about our natural world, chasing each other and playing games like ‘capture the flag’? SOLE’s summer programs, such as our Junior Naturalist Experiences SM captures the innocence of our youth, and for good reason. With an increase in screen time (on average 7.5 hours per day connected to some sort of media device) our youth are more removed from outdoor play. Let’s face it, technology is a blessing and a curse. Technological advances have continued to move us towards great advancements and development. However, they have also fostered us to move away from naturally developing critical-thinking and problem-solving, and other life skills. In addition, why do the heavy lifting when a machine can do it? Simply put, consistent access to ‘screen time’ has led to a more sedentary life-style. Interestingly, we have seen a surge in childhood obesity since technological advancements in personal computing and social media have come on scene. Causation or coincidence, you decide – one thing is for certain when you unplug and reconnect to the outdoors there are less distractions and ample opportunity to develop oneself in a healthy manner. Comprehension of abstract concepts. Experiential education provides the ideal modality to present, learn and master skills. Why? An intentionally designed and facilitated experiential education program, like SOLE’s SOLE Experiences SM, allows participants, to directly experience and learn via a hand-on, boots-on-the-ground approach which taps into different learning styles and individualized needs. From a neurological perspective, an experiential learning setting fosters the ideal environment to spark the brain and create memory pathways that sustains learning comprehension well beyond the actual experience promoting the opportunity for generalization to occur. This sort of positive growth and development supports future academic achievement. Developing a sense of belonging and affinity for nature. With the hustle and bustle of this crazy thing called “life” it seems we rarely have time to pause and take stock of what we are actually experiencing. Because the world around us can be a ‘blur’ and at an arms length, we may struggle to truly appreciate that which is around us. Summer SOLE Experiences SM allow us to do just that – slow down and take it all in, thus allowing us to develop meaningful relationships with those we are with and our surrounding environment. Experiences such as these forge memories that last a lifetime, and that can set a trajectory for positive choices for our community and its environment. Experiencing transformation that transfers. There is something truly special about Summer SOLE Experiences SM. Participants leave with greater self-confidence and willingness to take a risk, more awareness of the natural systems which exist in the natural world, lasting positive memories and relationships, and the list goes on. Thanks in part to our savvy Field Instructors and intentional program design, our participants are able to experience something which actually shifts their paradigm in a positive direction. This transformation is not accidental. For example, learning cool outdoor technical skills like land navigation (e.g., map and compass) on a Teen Trek Experience SM can serve as a metaphor and spring board for future leadership development opportunities whether on trail or the sidewalk. We hope that your summer is a memorable one, full of adventure and exploration in the great outdoors! We don’t normally send out seasonal programming updates, however, our summer 2015 season has been met with a tremendous drought sparking wildfires across our local and regional course areas. While SOLE continues to work diligently to run all courses on schedule in specific locales, modifications and even cancellations have been made to mitigate this backcountry risk. We have made these hard decisions based on the hard evidence which exists ‘out there’, which were recently supported by recommendations presented by local United States Forest Service (USFS) districts. These decisions will ensure that our clientele’s safety needs continue to be paramount, as well as, support local and regional land management agencies which active fire suppression efforts. If you have any questions or concerns please feel free to contact us. More specifically, as shown in the image above we have several wildfires in our course area(s) including the 6,147 acre Parker Ridge fire (in the Selkirk Mountains due North of Sandpoint, Idaho) and the Clark Fork Complex which includes the 2,143 acre Scotchman Peak fire (in the Cabinet Mountains due East of Sandpoint, Idaho), and the 576 acre Whitetail Peak fire. Also, we have numerous “hotspots” which are being currently tracked. Many of these wildfires were sparked by lightning as summer thunderstorms rubbled through over the last few weeks and months. For the most up to date information on local wildfires, including evacuations, road closures, and community meetings go to InciWeb. The SOLE family extends our sincere gratitude to those on the front lines and those affected. There is no doubt about it our current fire danger is extreme, so if you are planning to venture into the backcountry please exercise caution. Also, please contact you local Forest Service or other land management agency to get the most up to date information prior to heading out. These agencies can give you all pertinent information including current and active wildfires, and specific closures. Lastly, when recreating please minimize your impact by using outdoor skills and ethics supported by SOLE and our partners at the Leave No Trace Center for Outdoor Skills and Ethics. If you are interested in learning more please consider signing up for a Leave No Trace course. SOLE is currently offering a course on September 25th for National Public Lands Day. All proceeds collected will go to support SOLE’s Youth Scholarship Fund. Go to the SOLE Calendar to view a complete listing of all upcoming course offerings. There’s something about that ubiquitous campfire. It just draws us in, and there is nothing like sharing tall tales, kinship and laughter around a campfire. That said, campfires also have their drawbacks, especially when they are misused. In fact, campfires can scar and sterilize the ground, and their remnants can be left behind for thousands of years. Not to mention – wildfires. The reality – as many as 90 percent of wildfires are caused by humans. This summer is of special importance as we enter a significant drought for much of the Pacific Northwest and other parts of the country. In fact, our fire season is definitely going to be one worth noting as the current conditions are showing us (see the USGS figure below to see how dry it is). So what can we do about it? Simple. Follow Leave No Trace Principle #5 from our partners at the Leave No Trace Center for Outdoor Ethics. Fires vs. Stoves: The use of campfires, once a necessity for cooking and warmth, is steeped in history and tradition. Some people would not think of camping without a campfire. Campfire building is also an important skill for every camper. Yet, the natural appearance of many areas has been degraded by the overuse of fires and an increasing demand for firewood. The development of light weight efficient camp stoves has encouraged a shift away from the traditional fire. Stoves have be come essential equipment for minimum-impact camping. They are fast, flexible, and eliminate firewood availability as a concern in campsite selection. Stoves operate in almost any weather condition, and they Leave No Trace. Should I build a fire? The most important consideration to be made when deciding to use a fire is the potential damage to the backcountry. What is the fire danger for the time of year and the location you have selected? n Are there administrative restrictions from the agency that administers the area? Is there sufficient wood so its removal will not be noticeable? Does the harshness of alpine and desert growing conditions for trees and shrubs mean that the regeneration of wood sources cannot keep pace with the demand for firewood? Do group members possess the skill to build a campfire that will Leave No Trace? Lessing the impact when campfires are used. Camp in areas where wood is abundant if building a fire. Choose not to have a fire in areas where there is little wood at higher elevations, in heavily used areas, or in desert settings. A true Leave No Trace fire shows no evidence of having been constructed. What about existing fire rings? The best place to build a fire is within an existing fire ring in a well-placed campsite. Keep the fire small and burning only for the time you are using it. Allow wood to burn completely to ash. Put out fires with water, not dirt. Dirt may not completely extinguish the fire. Avoid building fires next to rock out crops where the black scars will remain for many years. What exactly is a mound fire? Construction of a mound fire can be accomplished by using simple tools: a garden trowel, large stuff sack and a ground cloth or plastic garbage bag. Collect some mineral soil, sand, or gravel from an already disturbed source. The root hole of a toppled tree is one such source. Lay a ground cloth on the fire site and then spread the soil into a circular, flat-topped mound at least 3 to 5 inches thick. The thickness of the mound is critical to insulate the ground below from the heat of the fire. The ground cloth or garbage bag is important only in that it makes cleaning up the fire much easier. The circumference of the mound should be larger than the size of the fire to allow for the spreading of coals. The advantage of the mound fire is that it can be built on flat exposed rock or on an organic surface such as litter, duff or grass. What about a fire pan? Use of a fire pan is a good alternative for fire building. Metal oil drain pans and some backyard barbecue grills make effective and inexpensive fire pans. The pan should have at least three-inch-high sides. It should be elevated on rocks or lined with mineral soil so the heat does not scorch the ground. What about firewood and clean-up? Standing trees, dead or alive, are home to birds and insects, so leave them intact. Fallen trees also provide bird and animal shelter, increase water holding capacity of the soil, and recycle nutrients back into the environment through decomposition. Stripping branches from standing or fallen trees also detracts from an area’s natural appearance. Avoid using hatchets, saws, or breaking branches off standing or downed trees. Dead and down wood burns easily, is easy to collect and leaves less impact. Use small pieces of wood no larger than the diameter of an adult wrist that can be broken with your hands. Don’t bring firewood from home. Either buy it from a local source or gather it responsibly where allowed. Burn all wood to white ash, grind small coals to ash between your gloved hands, thoroughly soak with water, and scatter the remains over a large area away from camp. Ashes may have to be packed out in river corridors. Replace soil where you found it when cleaning up a mound or pan fire. Scatter unused wood to keep the area as natural looking as possible. Pack out any campfire litter. Plastic items and foil-lined wrappers should never be burned in a camp fire. Provide adequate supervision for young people when using stoves or fires. Follow all product and safety labels for stoves. Use approved containers for fuel. Keep wood and other fuel sources away from fire. Join me on Saturday June 13th for a Leave No Trace Awareness Workshop or later this summer for a Leave No Trace Trainer Workshop! Idaho Gives BIG in 2015! As the Idaho Gives saying goes – when we are ALL in, we ALL win! This was no exception on May 7th, 2015 when I had the pleasure of witnessing local nonprofits in Bonner County, Idaho come together to work towards the common goal of supporting Idaho Gives – an annual 24-hour day of giving online for Idaho nonprofits. It is not often that we have the time to take pause and come together to do some good, so experiencing this community-based grassroots effort was meaningful. Together we were able to share our work to our stakeholders in Sandpoint, Hope, Bonner’s Ferry, Coeur d’ Alene and other North Idaho communities at Idaho Gives ‘donations stations’ and local events, including stops at our gracious hosts Evans Brothers Coffee Roasters and the Idaho Pour Authority. Overall, Idahoans should be proud. During Idaho Gives donors did in fact ‘GIVE’ to Idaho nonprofits totaling over $1,000,000 donated throughout our great state! As part of Idaho Gives, SOLE was the recipient of (2) separate ‘donation awards’ (i.e., financial awards given out periodically by the Idaho Nonprofit Center when people donate throughout the day). Specifically, two of the donations we received won a $500 ‘Golden Ticket Award’, as well as, a $250 ‘Donor Appreciation Award’. These awards brought our grand total to $2,016.00 received during Idaho Gives 2015! As a grassroots, voulnteer-driven nonprofit we view this as a great day because some local area youth will now be able to explore, achieve, and lead through the transformational experiential and outdoor education programs we provide. Specifically, these funds will be placed in the SOLE Youth Scholarship Fund – a scholarship fund for local area schools and individuals to participate in SOLE programming.